Simon Bird started his comedy career with the Cambridge Footlights in 2004, as a writer of their touring show Beyond A Joke. He appered in 2005 show Under The Blue, Blue Moon and 2006's Niceties. 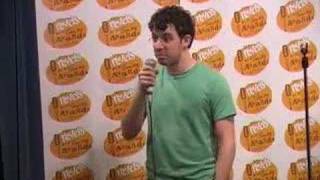 He took part in Chortle's national student comedy awards for four years in a row: 2005, 2006, 2007 and 2008, coming second in his final attempt with a routine mocking his repeat entries. He played the part of Will in E4’s comedy The Inbetweeners, alongside Joe Thomas, which won him the British Comedy Award for best newcomer in 2008, and became the biggest British comedy hit when it was turned into a movie. The pair also had a sketch group, House Of Windsor, with Johhny Sweet, which span off into the TV series Cowards. He landed a central role in the Channel 4 sitcom Friday Night Dinner in 2011, as one of two Jewish twentysomething brothers (alongside Tom Rosenthal) who revert to childhood roles at the weekly family meal. And he hosted the BBC Three panel game The King Is Dead. Sorry. We have no listings of forthcoming performances by Simon Bird. We do not currently hold contact details for Simon Bird's agent. If you are a comic or agent wanting your details to appear on Chortle, click here.